Marshall began playing violin at the age of 5, using the Suzuki method, and attended several Suzuki-based summer camps in the Portland area. As he grew older, he picked up the mandolin and was greatly influenced by the work of Mark O’Connor (fiddle) and Chris Thile (mandolin). 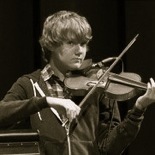 Marshall attended the Mark O’Connor Strings Camp and became exposed to free and improvisational style playing. While living with his family in Europe he had a chance to play in numerous International Honor Orchestras in Vienna, London, Geneva, and Beijing. Additionally, Marshall had a close relationship with Jesus Florido, a noted Latin Jazz fiddle player who helped develop his improvisational style. When in middle school, Marshall became fascinated with the guitar and applied much of his single-note playing from the violin to the guitar. He’s been a regular electric and acoustic guitar player in his church youth group, and for the the large worship at Sunset Presbyterian Church in suburban Portland.